The Cobra XRS 9950 provides total protection and peace of mind with Xtreme Range Superheterodyne Technology, detecting all 12 radar/laser bands with its super-fast lock-on detection circuitry. The Cobra XRS 9950 unit provides extra detection range and the best possible advance warning to even the fastest of POP mode radar guns. It comes with the Cobra exclusive full-color ExtremeBright DataGrafix Display II, an 8-point electronic compass, Voice Alert, and car battery voltage display/low car battery warning. The Cobra detector radar responds to all types of radar currently in use by police, and provides 360 degree detection of all types of laser guns laser. The XRS-9950 also provides detailed messages from Cobra's exclusive Safety AlertÂ® and Strobe Alert warning systems. 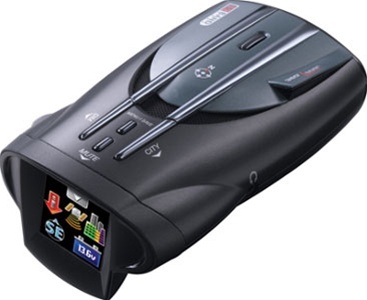 This Cobra detector radar is immune to the VG-2 and Spectre I radar detector detectors, and provides alerts when VG-2 and Spectre I are in use. 12-Band Detection Detects 6 radar, 4 laser and 2 safety signals. Radar signals include X Band, K Band, Ka Superwide, Ku Band, VG-2 and Spectre. Laser signals include LTI 20-20, Ultra Lyte, ProLaser and ProLaser III. Safety signals include Safety AlertÂ® and Strobe AlertÂ®. Available Speed/Red Light Camera Location Alerts With the purchase of the available GPS locator, the driver can be warned of upcoming speed and/or red light camera locations, utilizing the state-of-the-art GPS (Global Positioning System) engine. Full Color ExtremeBright DataGrafixÂ™ Display II 1.5" high-res OLED display provides enhanced data display in easy to read vivid color with 3D graphics. Also allows user to select from 5 different color themes to match dash illumination. VG-2 AlertÂ®/ Undetectable Provides complete immunity and alerts the driver when under surveillance of VG-2 Radar-Dectector-Detectors. Spectre AlertÂ™/Undetectable Provides complete immunity and alerts the driver when under surveillance of Spectre 1 Radar-Detector-Detectors. Strobe AlertÂ® A Cobra exclusive, works with tens of thousands of emergency vehicles currently equipped with traffic light controlling strobe emitters. Provides advance warning of the presence and/or approach of emergency vehicles. IntelliShieldÂ® False Signal Rejection 3-Level City Mode offers the best flase signal rejection in both urban and rural areas. SmartPowerÂ™ Automatically shuts off power to the unit when ignition is turned off. EasySetÂ® Programming Menu User-friendly mode selection/setting with visual guidance. Low Car Battery Warning Alerts user whenever battery voltage falls below 11.9 volts. 8-Point Electronic Compass Automatically provides an accurate electronic direction reading.